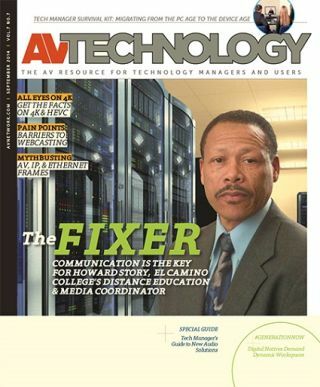 AV Technology: Does your AV manager work with the IT department on campus? Howard Story: Yes. I feel it is critical for the manager of the AV department to develop a good working relationship with the IT director, especially if they work in different areas. In many cases, the AV manager will be on the academic side of the house and the IT manager on the fiscal side. Both must understand that both areas play a critical role in supporting the institutional mission. Can you share more insight for folks on what it is like to work in connected AV and IT departments? Howard Story: Almost everything we do with technology now involves IT. Many systems overlap. As a result, AV and IT departments that used to work separately must now communicate and work together. One example on my campus: We use a software-based AV control system in our classrooms. The software for this system sits on a server in the IT department. The AV department has responsibility for the deployment and support for this system. The interface (Dashboard) that communicates with the server in IT resides on the PC in the faculty lectern. IT also has responsibility for maintaining the PC. When IT images the computers, our Dashboard interface can be erased and the AV control system will not work. If the IT and AV technicians do not communicate, the system will not work causing havoc for the faculty members. The AV department will get the call to fix the problem. Many times, the instructor is not sure who to call and they do not care which department is responsible. They just want someone to fix the problem quickly. Hopefully, the two departments have a relationship where they can communicate with each other and resolve problems quickly. I have found that it is critical for the AV manager to establish a collaborative relationship with the IT manager. They both should serve on the college technology committee and encourage their employees to work with each other when necessary. I feel that communication is the key. Both areas have unique responsibilities and challenges. Collectively, what are the major limitations that you’ve had to overcome in the past year or two? Howard Story: Development of a plan to meet the demand for BYOD in facilities that do not have the infrastructure required. This includes limited Wi-Fi service in areas of campus, inappropriate classroom design to facilitate new teaching and learning approaches. There’s a lack of education and understanding of the challenges associated with the introduction of new technology into the educational environment, plus a lack of financial resources and staff to introduce new technology. What are the major challenges for managing BYOD environments such as college facilities? Howard Story: BYOD has to work for everyone, and there are so many variables. Lack of standardization is another challenge. It’s difficult to support technology developed for consumers. Bring Your Own Device (BYOD) can mean anything that is available for sale. There are numerous manufacturers—large and small—using different software and equipment. Today, technology changes very quickly, making it extremely difficult for institutions that might be financially challenged to accommodate the various devices and operating systems available to the public. Our plans must include how BYOD can be integrated into the existing classroom technology infrastructure. Consideration must also be given to how technology departments will train and support users. All students and professors are not at the same level when it comes to using their devices. IT departments have the challenge of keeping their networks secure. Despite these challenges, our students and faculty want to use their devices everywhere on campus. What technology trends are you most interested in this year? Howard Story: We will continue to try to develop a plan to accommodate the BYOD movement. I also feel that it is extremely important to continue to explore ways to simplify how our clients use and operate the myriad of technologies available today. Are you planning on buying new AV equipment in the next year? Howard Story: I am interested in the deployment of the new short throw projectors that incorporate Smart Technology that do not require a conventional “SMART Board.” We also plan to deploy ceiling doc cams to enhance teaching in departments (Cosmetology, Automotive Repair, and so forth) that require instructors to demonstrate techniques and procedures. Interactive flat-panels and other technologies that enhance the teaching and learning process are also of interest.